I’m honored to have been asked by Sarah and Joanne to write a piece for their blog site. Although I first learned of Grace Dalrymple Elliott (1754–1823) through an article in the BBC History Magazine, it was Sarah and Joanne’s book, An Infamous Mistress which provided me an expanded view into Grace’s life and in particular, her activities during the French Revolution. Portrait of Grace Elliott. 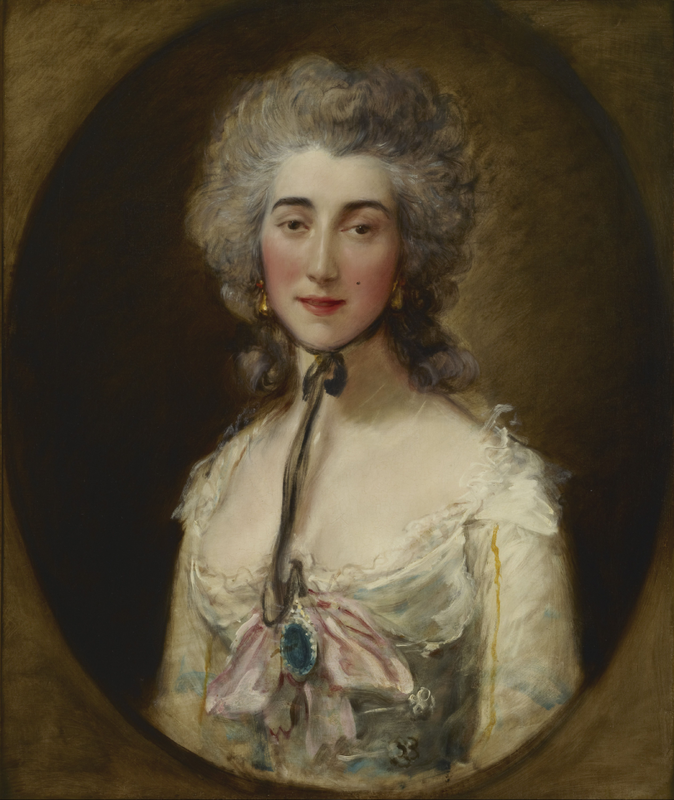 Oil painting by Thomas Gainsborough (c.1782). Frick Collection. PD-100+ Wikimedia Commons. I would like to introduce you to Juliette Récamier (1777–1849). Although twenty-three years younger than Grace, Madame Récamier had many things in common with Mrs. Elliott—although I’m not quite sure the term “courtesan” would apply to Juliette as it did for Grace. Similar to Grace, Juliette married an older man (by 30-years) and suffered a loveless and unconsummated marriage (he was rumored to have been her biological father). Each of them moved about effortlessly in the upper echelons of society but died virtually penniless. Both of these women were so gorgeous that famous artists clamored to paint their portraits. Portrait of Madame Juliette Récamier. Oil painting by Antoine-Jean Gros (1825). Strossmayer Gallery of Old Masters. PD-100+ Wikimedia Commons. Juliette Bernard was born into the family of Jean Bernard, King Louis XVI’s counselor and receiver of finance. Her mother ran one of the most sought after salons in Paris and it was there, at the age of fifteen, that she was introduced to and ultimately married the 42-year-old banker Jacques-Rose Récamier. By the time Juliette had turned eighteen, Marie Antoinette had heard of her beauty and sent for her. 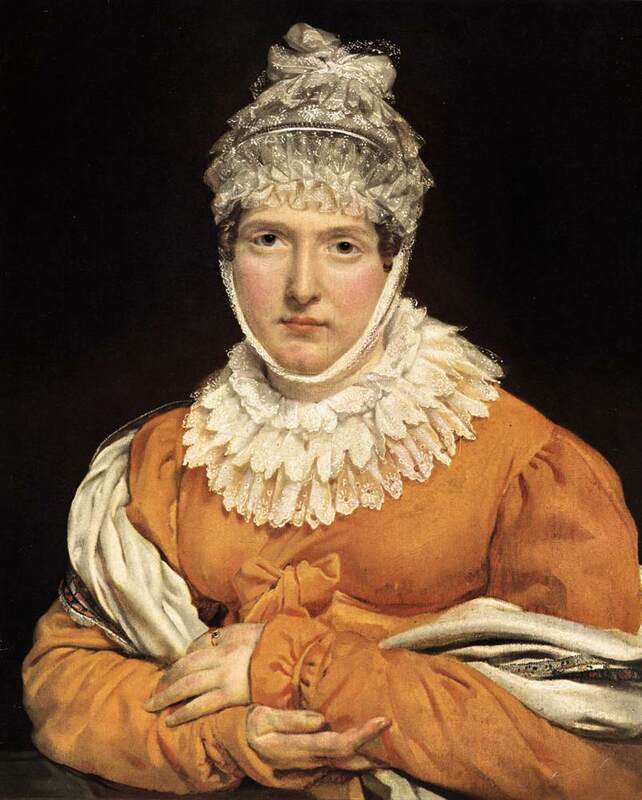 Unlike Grace, Mme Récamier hid her loveless marriage and divorce was not an option. Reportedly, she remained a virgin until the age of forty-two. It is a wonder that Juliette’s husband escaped the blade of Madame Guillotine during the French Revolution. It seems his friendship with the revolutionary Jean Jacques Régis de Cambacérès (1753–1824) allowed M. Récamier to keep his head. When Juliette was twenty-one, M. Récamier purchased the former residence of the king’s finance minister, Jacques Necker. Located on Rue du Mont-Blanc—today 7 rue de la Chaussée-d’Antin—the mansion would serve as the site for Juliette’s luxurious balls, receptions, and most important, her salon. 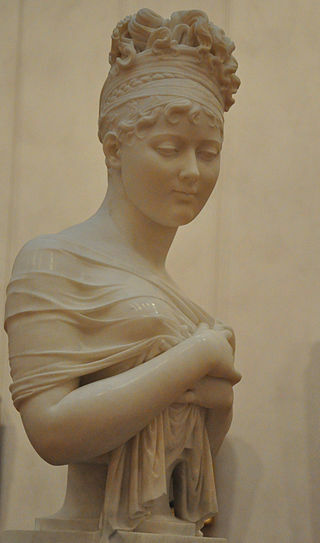 Bust of Juliette Récamier. Photo by Philippe Alès (2012). Musée des Beaux-arts of Lyon, France. PD-Creative Commons Attribution-Share Alike 3.0. Wikimedia Commons. Besides her exquisite beauty, Juliette was well known for her Paris salon and as one of the city’s leaders of fashion. Her salon was extremely fashionable with discussions centered on politics and literary interests. Her circle of friends included Lucien Bonaparte (Napoléon’s brother), Mme Germaine de Staël, François-René de Chateaubriand, various foreign princes, and many famous contemporaries during the time of the Empire and first Restoration. 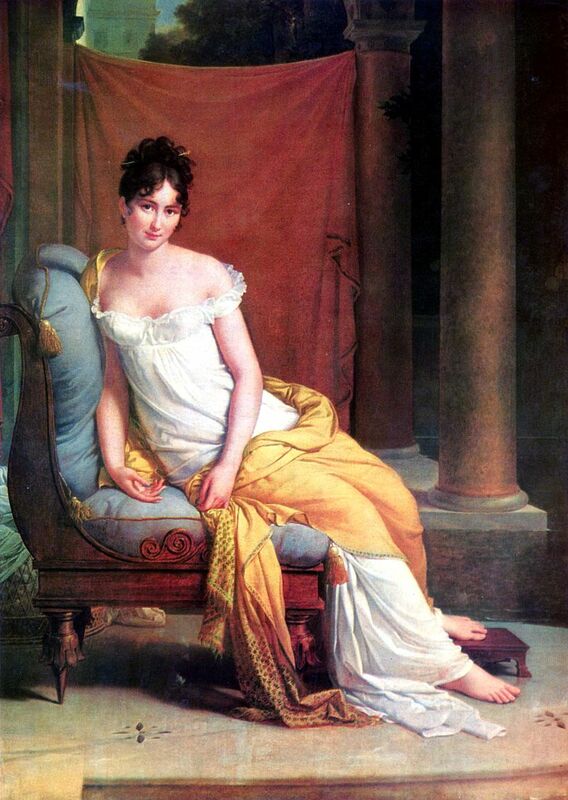 Juliette turned down an invitation to be lady-in-waiting for Napoléon’s wife, Joséphine. Coupled with her strong friendship with Mme Staël, Napoléon ordered Juliette to be exiled along with Mme Staël, a fervent monarchist and outspoken opponent of Napoléon and the Empire—Juliette moved to Italy whereas Germaine took up residence in Switzerland. Juliette returned to Paris after Napoléon was sent into his exile (turn about is fair play?). She continued to receive visitors at her apartment located at 16 rue de Sèvres (the building was demolished in the early 20th-century). Portrait of Madame Récamier. Oil painting by François Gérard (1805). Musée Carnavalet. PD-100+ Wikimedia Commons. Juliette Récamier died of cholera and is buried in the Cimetière de Montmartre. We will visit Juliette’s grave in my seventh book Where Did They Bury Jim Morrison the Lizard King? A Walking Tour of Curious Paris Cemeteries. One of the legacies Juliette left us with is the Récamier sofa. She is lounging on the sofa in Jacques-Louis David’s famous portrait of her. 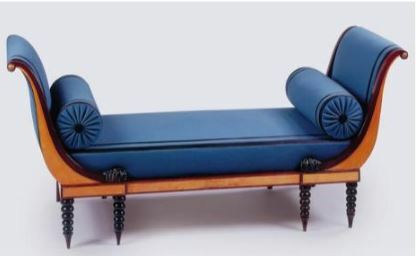 The original Récamier sofa can be seen at the Louvre. As you view the painting at the top of the post, notice Juliette is not wearing any slippers or shoes. When David introduced the painting to the general public there was a huge scandal over her being presented barefoot. The Original Récamier Recliner used in David’s Portrait of Mme Récamier. Photo by anonymous (date unknown). Original recliner located in the Louvre Museum. Wikimedia. Portrait de Juliette Récamier. Oil painting by Jacques-Louis David (1800). Louvre Museum. PD-100+ Wikimedia Commons. Fascinating, Stew. Just ordered your two books on Revolutionary Paris. I’ll be in touch as this is the setting for my next Georgian romance, A Fierce Wind, coming in 2018.